Games and other playable forms, from interactive fictions to improvisational theater, involve role playing and story--something played and something told. 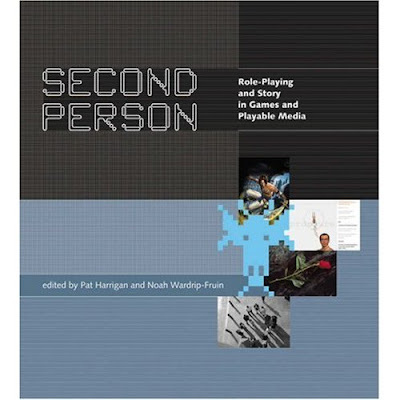 In Second Person, game designers, authors, artists, and scholars examine the different ways in which these two elements work together in tabletop role-playing games (RPGs), computer games, board games, card games, electronic literature, political simulations, locative media, massively multiplayer games, and other forms that invite and structure play. Second Person--so called because in these games and playable media it is "you" who plays the roles, "you" for whom the story is being told--first considers tabletop games ranging from Dungeons & Dragons and other RPGs with an explicit social component to Kim Newman's Choose Your Own Adventure-style novel Life's Lottery and its more traditional author-reader interaction. Contributors then examine computer-based playable structures that are designed for solo interaction--for the singular "you"--including the mainstream hit Prince of Persia: The Sands of Time and the genre-defining independent production Façade. Finally, contributors look at the intersection of the social spaces of play and the real world, considering, among other topics, the virtual communities of such Massively Multiplayer Online Role Playing Games (MMORPGs) as World of Warcraft and the political uses of digital gaming and role-playing techniques (as in The Howard Dean for Iowa Game, the first U.S. presidential campaign game). In engaging essays that range in tone from the informal to the technical, these writers offer a variety of approaches for the examination of an emerging field that includes works as diverse as George R.R. Martin's Wild Cards series and the classic Infocom game Planetfall. Second Person features three complete tabletop role-playing games that demonstrate some of the variations possible in the form: in John Tynes's Puppetland, players take on the roles of puppets in a land ruled by the villainous Punch; Greg Costikyan's Bestial Acts imports the techniques of Bertolt Brecht's theater of alienation into a dark role-playing structure; and in James Wallis's The Extraordinary Adventures of Baron Munchausen, the gameplay revolves around spinning elaborate tales in the style of the famous raconteur.